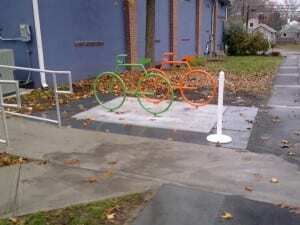 Thanks to the township for putting the finishing touches to the bike racks at the West Windsor Arts Center. New concrete and flagstone borders were recently installed, and look very classy indeed. Now nobody needs to worry about getting their bike dirty when attending an event at the arts center. Oh yeah, or your shoes, either! Eagle Scout Paul Ligeti sent us this report on our Nov. 13 ride along the route through town that he developed, mapped and marked. About 15 people participated–a perfect size given the stops along the way for explanations of the sites. 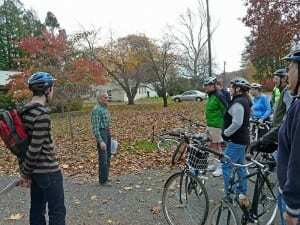 The rescheduled inaugural ride of the West Windsor Interpretive Historic Bike Trail took place on Nov. 13. Unlike the wintry weather of the original date, we were met with a mild, pleasant fall afternoon. I was happy to see the riders enjoy the trail, which is the result of my Eagle Scout project in West Windsor’s Troop 66 and two years of work. The 11 mile-long trail, which I designed with historical and traffic considerations in mind, winds through much of the town. My troop and I laid red plaques in front of many historically significant sites, including the Dutch Neck Presbyterian Church, the Schenck Farmstead and Grovers Mill. The highlight of Sunday’s ride was a stop near Grovers Mill to hear a local resident regale us with a vivid description of the days in his youth during the infamous October 1938 War of the Worlds radio broadcast. He also recounted subsequent commemorations of the event attended by the likes of governors and the writer of the original broadcast. 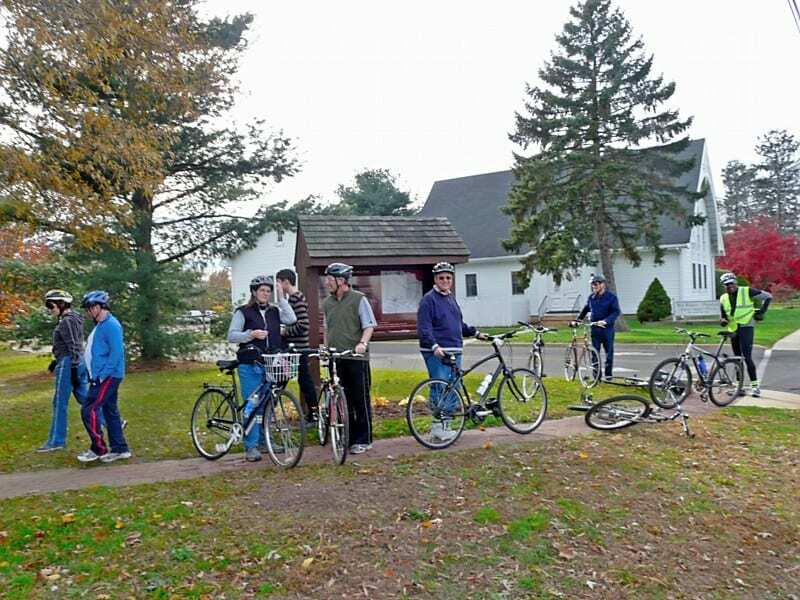 Anyone interested in riding the trail, or just learning more about the history of West Windsor, is invited to check out the website http://wwhistoricbiker.weebly.com/. As an online companion to the trail, it provides a map of the route and historical background on the sites with the markers and dozens of others, as well. Thank you WWBPA for arranging the inaugural ride. And thank you, Paul, for creating it! 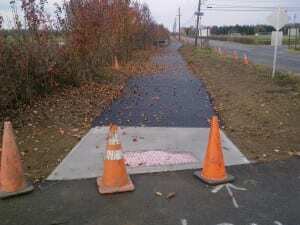 This past week saw the pavement laid on the new trail along South Post Road from Village Road to Conover Road. This trail will see heavy use by the rowers at Caspersen Rowing Center, who do their warmup runs along this stretch of road, which borders the Mercer Oaks golf course. We also hope to see families use it as they head to the ballfields at the corner of Conover Road. Thanks to the township and county for working together on a grant for this trail! Caspersen Rowing Center is run by the Princeton National Rowing Association (PNRA), which was recently named 2011 USRowing Club of the Year by USRowing, the United States’ governing organization for Olympic and World Cup rowing. Located on Mercer Lake in Mercer County Park, Caspersen Rowing Center is an Olympic and U.S. Women’s National Team Training Center, home to the Mercer Junior Rowing Club for high school students and the Mercer Master’s Rowing Program for adults, as well as to area private school rowing programs. Mercer’s programs have many members in common with the WWBPA, including this author’s spouse and daughter. More information can be found at rowpnra.org. WWBPA trustees and volunteers were at St. Anthony’s of Padua church in Hightstown on Sunday to promote the need for bicyclists and pedestrians to be seen at night. Thanks to a generous donation by the West Windsor Policemen’s Benevolent Association, we were able to offer lights, reflective visibility gear (from vests to simple reflective tape) and helmets for below cost. Thanks to everyone who participated, and to the PBA! These events are important to get people who walk and/or ride their bikes to work in the dark to be more visible to motorists, and therefore safer. 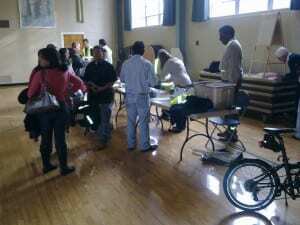 The event was very well attended, and more are planned. If you’d like us to come to your organization, please contact us at wwbikeped@gmail.com. Spanish Speakers (And Other Volunteers) Wanted! Help us promote nighttime visibility among “invisible” cyclists and others. We will be at St. Anthony’s of Padua in Hightstown at 1:30 p.m. on Sunday, Nov. 20 and at St. Paul’s in Princeton at 7 p.m. Monday Nov. 28. At each event, we will give a short presentation in Spanish (and English) that also includes some basic “rules of the road.” We’ll then offer visibility and safety items such as reflective vests, lights and helmets for half price, funded in part by a generous donation from the West Windsor Policemen’s Benevolent Association. 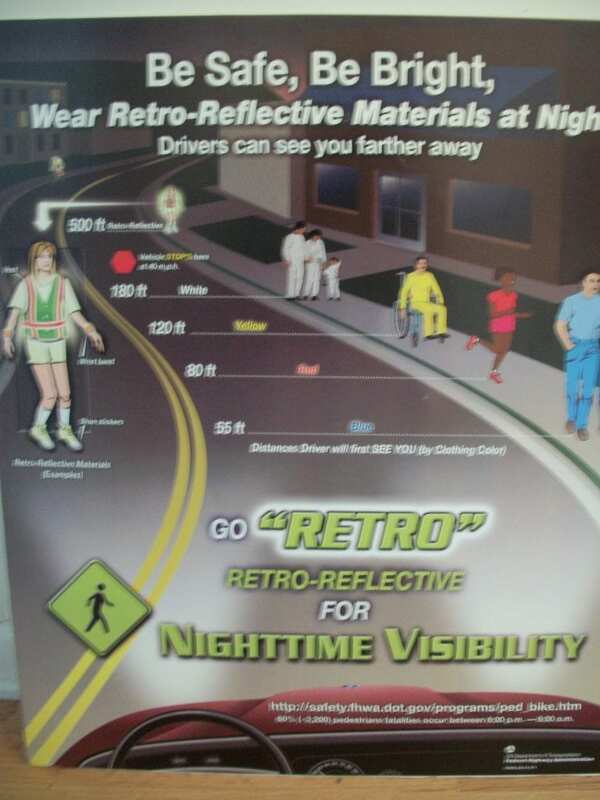 We need people who can help with the presentation as well as Spanish and non-Spanish speakers to help fit helmets, model vests and otherwise encourage “invisible” cyclists to be more visible to motorists at night. Would your place of worship be interested in a safety presentation? Or have another suggestion? Email us! 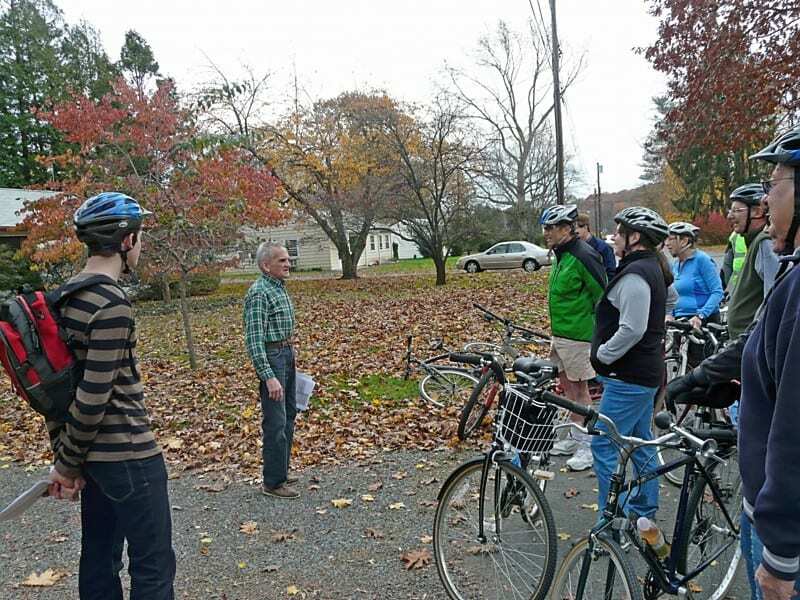 The WWBPA’s snowed-out 11-mile ride of historic West Windsor sites has been rescheduled for this Sunday, Nov. 13, at 2 p.m. The ride is free and open to all, but helmets are required. While much of the route is on roads with bike lanes or on quiet residential streets, it does include a portion of Cranbury Road. Children under 12 should be accompanied by an adult. Please bring a signed copy of the wwbpa waiver form. The weather forecast at this point calls for sun, but dress in layers just in case the sun isn’t shining as strongly as we’d like. Halloween this year was unusual for the early snowfall and the downed branches littering the curbs along with the leaves. 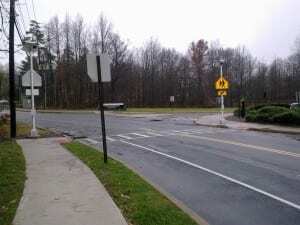 West Windsor was fortunate to have power, compared to many New Jersey towns, and in my neighborhood the township removed 2 trees blocking roads Saturday night, so things were pretty much back to normal for the big night on Monday. 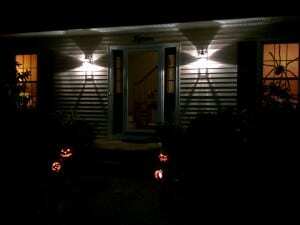 We had a pleasant Halloween night – lots of smaller children showed up, very cute in their costumes. It’s a nice change from a few years ago, when we got mostly older teenagers – the neighborhood is turning over, young families moving in. Our new township LED sign by the high school advertised something called “Trunk or Treat.” Apparently this involves celebrating Halloween in a parking lot, where participants decorate their cars, and their children visit each car in the lot, getting their candy from fellow travelers. We can see where this kind of event may be attractive for those who don’t live in a neighborhood, but hope it complements instead of supplants traditional Halloween – we’d hate to miss out on a chance to build a sense of community with our neighbors. Many communities also hold Halloween parades, to get a critical mass of people walking. An even more innovative idea might be to have a car-free neighborhood between certain hours on Halloween. West Windsor is fortunate to have safe neighborhoods – we don’t have to wait for Halloween to take the opportunity to walk around and talk, or at least wave, to our neighbors . By walking, not only will you feel healthier, you’ll help provide better neighborhood safety, acting as “eyes on the street.” With nearly ubiquitous cell phones with cameras, anyone can provide immediate assistance to law enforcement. We live in a safe town, let’s help keep it that way – by taking a walk!